1. That use of illicit drug is a powerful incentive for the activities of criminal organizations in all regions of the world. 2. That despite the efforts of the international community over decades, the use of these substances continues to increase globally, generating substantial income for criminal organizations worldwide. 3. That having financial resources of enormous magnitude, organizations of transnational organized crime are able to penetrate and corrupt institutions of the States. 4. That it is essential to implement effective measures to prevent illegal flows of arms to criminal organizations. 5. As long as the flow of resources from drug and weapons to criminal organizations are not stopped, they will continue to threaten our societies and governments. 6. That, consequently, it is urgent to review the approach so far maintained by the international community on drugs, in order to stop the flow of money from the illicit drug market. 7. That this review should be conducted with rigor and responsibility, on a scientific basis, in order to establish effective public policies in this area. 8. That nations should intensify their efforts to further strengthen the institutions and policies of each country in the prevention and punishment of crime, their social programs in education, health, leisure and employment, as well as prevention and treatment of addictions to preserve social fabric. 9. That states should endorse their commitment to fight with determination and according to the principle of shared and differentiated responsibility, transnational criminal groups through mechanisms of international cooperation. 10. That the United Nations should exercise it´s leadership, as is it´s mandate, in this effort and conduct deep reflection to analyze all available options, including regulatory or market measures, in order to establish a new paradigm that prevents the flow of resources to organized crime organizations. 11. 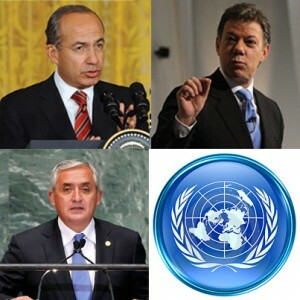 In this regard, the governments of Colombia, Guatemala and Mexico invite Member States of the Organization of the United Nations to undertake very soon a consultation process that allows, taking stock of the strengths and limitations of the current policy, and about the violence generated by the production, trafficking and consumption of drugs in the world. We believe that these results should culminate in an international conference to allow the necessary decisions in order to achieve more effective strategies and tools with which the global community faces the challenge of drugs and their consequences. Issued on Oct. 1, 2012.